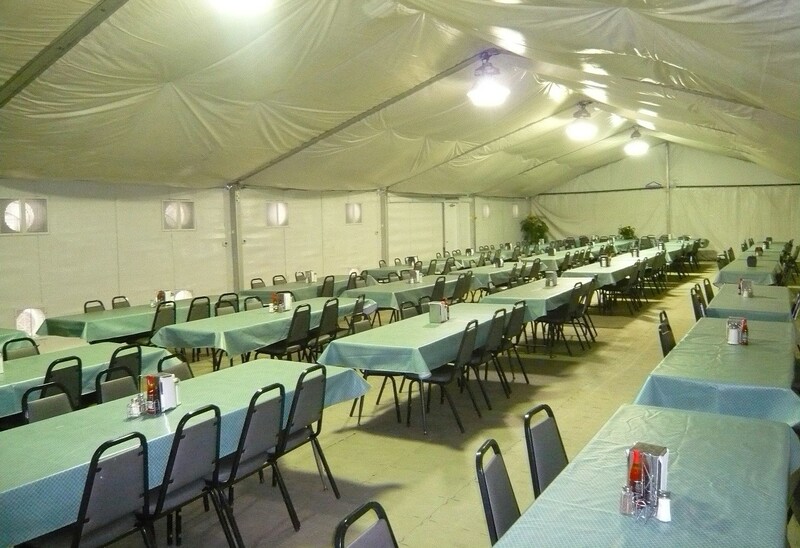 To complete your base camp operations, Mahaffey can install a dining facility (DFAC) on-site with cafeteria-style seating to serve 50 to over 3,000 people. Our knowledgeable military team offers food service and equipment specifically designed to meet the challenges of remote site feeding. We work together year-round with our food service partners, sometimes providing up to 8,000 meals per day. Depending on your food service needs, job-specific food trailers are brought in. Refrigerated and freezer trailers provide sanitary storage, and diesel generators with a seven-day supply of fuel ensure the safety of all food. Main kitchen trailers for food preparation and drink trailers with cold water lines are brought on site. Kitchens are equipped with generators for power distribution and backup generators for continuity. We offer outside lighting for personnel safety, as well as an array of flooring options. Mahaffey food service is designed to exceed your needs in remote locations or wherever base camps are needed.